There is no busier time than Tet for Thuy Tram village in the northern province of Phu Tho as the year comes to an end. 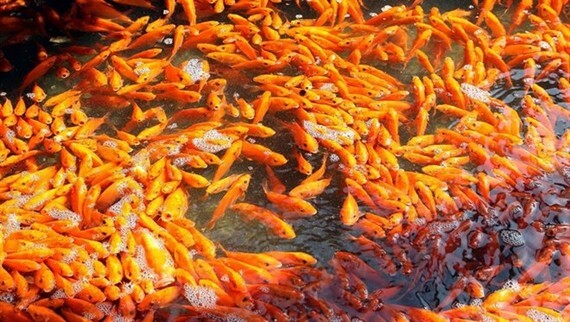 It is a time of high demand for the village’s famous produce, golden carp. On the 23rd day of the last month of the year, Vietnamese families hold a send-off ceremony for the ong Cong ong Tao, the genies found in every Vietnamese home. Special offerings are made at New Year. Among other things, golden carp are indispensable. After prayers are finished, the carp are released into a large body of water, usually lakes, but preferably streams or rivers. While commonly known as the gods of the kitchen, ông Cong ong Tao is composed of three separate genies, who are in charge of the land, the fireplace and the house. It is believed that at New Year they ascend to the Heaven to report on the good and bad deeds that happened in the house during the year. The carp will serve as their mean of transportation and therefore, must be healthy and looking their best. Nguyen Van Dat, a villager his family had been raising carp for three generations. Dat learned the trade from his grandfather and his father before taking over the family business. When Tet arrives, business blooms as large numbers of carp are ordered from all over the region.